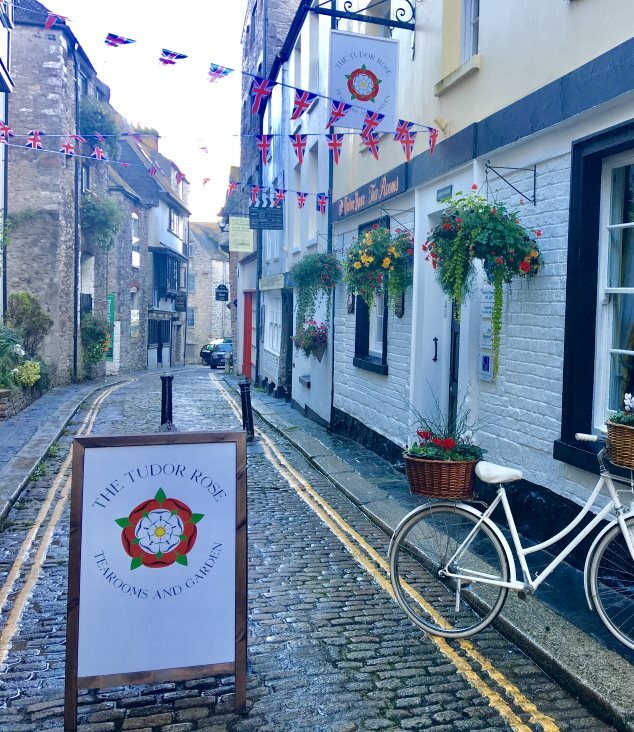 The Tudor Rose Tearooms and Garden is situated in one of the beautiful listed buildings on New Street on the Barbican, one of the oldest streets in Plymouth. 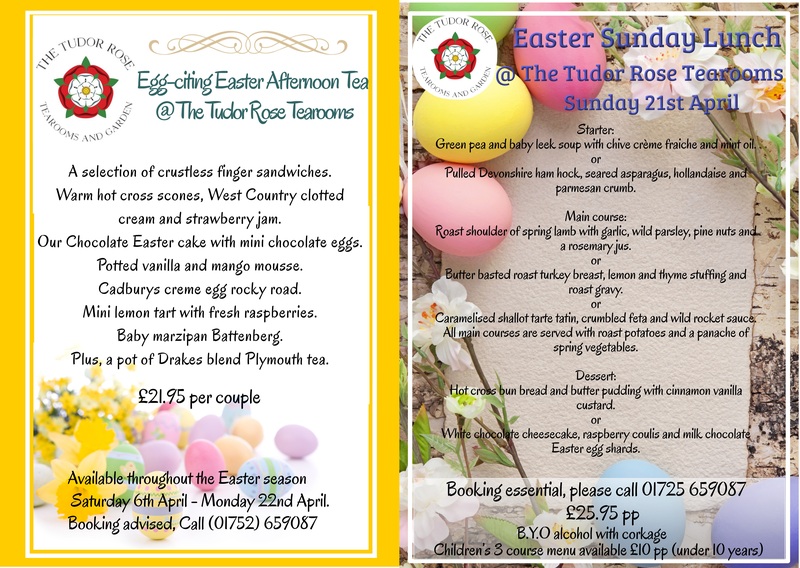 We have lovingly renovated the Tudor Rose breathing new life into its quaint tearoom, charming lounge, elegant patio and historic walled English garden. Our ancient cobbled lane is only meters from the world famous Mayflower steps where the pilgrim fathers set sail in 1620 to discover America and the new world. Here at the Tudor Rose, we start each day by freshly baking our delicious scones, the appetizing aroma fills the air, the temptation is often too great for passers by to resist. Whether you are taking a leisurely stroll through the ancient cobbled streets of Plymouth’s old town, discovering the Barbican’s fascinating history, a regular to the area or simply walking your dog, the Tudor Rose is the perfect stop for breakfast, lunch, afternoon tea or just a refreshing drink. Savour the moment and choose from one of our exquisite loose leaf teas to suit your individual taste or enjoy a perfectly poured cup of coffee. All our coffee is roasted in the West Country and freshly ground by us at the Tudor Rose. Why not try our signature “New Street Sandwich Cake”? We are passionate about tasty home cooked food and pride ourselves on a friendly welcome and great service. Our trusted suppliers provide us with fresh, seasonal produce to use in our menus, which is locally sourced wherever possible. We offer bespoke menus for private parties, special occasions, business meetings, coach parties and more. We offer Tudor Rose loyalty cards as well as a senior and student discount. We look forward to welcoming you and hope you enjoy your visit with us as much as we enjoy having you! We offer a choice of two succulent roast meats for you to choose from, or why not have a mix of both? We also make a hearty vegetarian option if you prefer. a selection of four seasonal vegetables, our signature gravy and of course not forgetting the homemade pudd! Although care is taken, due to the nature of a busy, open kitchen, we cannot guarantee the absence of the 14 notifiable allergens in our dishes. Please speak to a member of our team before placing your order if you have any food or drink allergens or intolerances. Breakfast served till 11.30am and 12 noon on Sunday. Grilled back bacon, butcher’s sausage, oven roasted tomato, black pudding, baked field mushroom, fried potatoes, baked beans, fried egg & toast. Pan fried Halloumi cheese, baked field mushroom, oven roasted tomato, fried potatoes, baked beans, wilted spinach, fried egg & toast. Why not bring your own bottle? Crispy battered cod and chips with mushy peas, tartare sauce and a wedge of lemon. Pan fried vegetable hash with a delicious nutty fried butter flavour, free range fried egg and a squeeze of HP Sauce. Grilled back bacon, butcher’s sausage, fried egg, oven roasted tomato and field mushroom, baked beans and seasoned chips. A full flavoured bowl of seasonal soup, fresh cut bloomer bread and butter. Individual baked seasonal quiche simply served warm with a dressed house salad and rustic slaw. Homemade smoked mackerel pate with toasted ciabatta and lightly pickled vegetables. Pan seared Halloumi cheese with a brightly coloured crisp vegetable salad, flat leaf parsley and toasted sesame seeds. Five freshly cut assorted finger sandwiches with a teacup of seasoned chips. Or choose one of our thickly sliced bloomer bread sandwiches served with kettle crisps. Roast turkey breast, bacon and avocado mayonnaise, crisp red onion and fresh gem leaves. Sliced mature cheddar, crisp gem lettuce, fresh tomato and rustic slaw. Our children’s menu includes either a carton of orange of apple juice. Although care is taken, due to the nature of a busy open kitchen, we cannot guarantee the absence of the 14 notifiable allergens in our dishes. Please speak to a member of our team before placing your order if you have any food or drink allergens or intolerances. Homemade fruit & plain scones served warm with strawberry jam, West Country clotted cream & a pot of Drake blend Plymouth tea. Two homemade savoury cheese scones served warm with whipped cream cheese, our house chutney and a pot of Drake blend Plymouth tea. Homemade gluten free scones served warm with strawberry jam, West country clotted cream and a pot of Drake blend Plymouth tea. Homemade Vegan scones served warm with strawberry jam, coconut clotted cream and a pot of Drake blend Plymouth tea and soy milk. A selection of crustless finger sandwiches, a warm fruit or plain scone, strawberry jam, clotted cream, a slice of homemade cake & a variety of dainty delights. Served with a pot of Drake blend Plymouth tea. A selection of crustless finger sandwiches, a warm cheese scone, whipped cream cheese and house chutney plus an assortment of savoury bites. Served with a pot of Drake blend Plymouth tea. 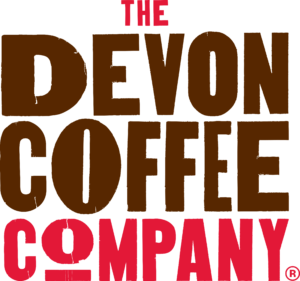 Our coffee is roasted in the West Country by The Devon Coffee Company and freshly ground by us at the Tudor Rose. Our teas are supplied by Plymouth Tea, choose our house brew Drake blend or one of our exquisite loose leaf speciality teas. Earl Grey, Darjeeling, Peppermint, Jasmine Leaf, Lemon & Mango, Camomile, Green Tea (Chun Mee), Berry Berry, Chai. Alfresco dining in the historic walled garden and elegant patio. Private function room hire / conference room hire. Allergy and food intolerance compliance. Afternoon tea on the Barbican. Disabled customers are welcome. Unfortunately we are currently unable to offer wheelchair access to the building, however we are happy to help however possible to people that need assistance.